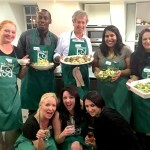 Wickedfood Cooking School in Johannesburg recently hosted the members of Barloworld for a fun-filled morning of cooking. Participants were given a Italian recipe and ingredients to cook 6 dishes making up a 3-course meal. This team building idea was a great way for the team to get together and all participate in a cooking group activity. The meal was absolutely delicious which goes to show that even a bunch of accountants can cook! Wickedfood Cooking school in Sandton also offers cooking classes for hobby cooks and beginners wanting to learn more in the kitchen. Our cooking lessons range from the basics, think of these cooking classes as your introduction to cooking and feeling more confident in your own kitchen. All the way to more advanced cookery lessons which dive more into specific cuisines. For more information and what classes are scheduled for the upcoming months, click here.